In our regular displays throughout the UK, we feature ferrets, hawks, eagles, buzzards, falcons and owls. If a client wishes, we can put on displays featuring just one or any combination of these animals. Whichever service we supply, clients can rest assured that the displays – both static and active – will be presented in the most professional manner, and be entertaining, educational and strictly in step with the ethos of the organisation and the event. A typical day may see a display featuring some of our owls, including the beautiful and highly endangered barn owl, and the largest species of owl on earth – the Eurasian eagle owl, with a wingspan of over 2 metres. The next display may include our ferrets, hawking dogs and hawks all working together. In another display, we may fly our eagle or one of our falcons, capable of flying at speeds of over 150 mph. Whatever species we are flying, the methods used are all steeped in the rich traditions of the sport. We give a thoroughly professional service, tailored to meet the demands of your organisation and its publics, reflecting the very best in entertainment, conservation, and education. Our service is designed to give your customers the very best experience, with lots of audience participation where appropriate. In addition to the flying, we can also stage a static display of the birds, along with an educational interpretative display, using display boards and professionally produced material. Our static display is fully self-contained, with barriers, shelters, cages etc. for all the animals that we bring. This display is manned, and staff are happy to chat to visitors and answer their questions. You can rest assured that we will never do anything to put in danger visitors or the birds themselves. All of the birds that we use are “bomb proof” having been bred and trained for the job. Guests will delight in seeing the small owls fly, marvel at the size of the eagle owls, and be astounded at the speed of the falcons (which can reach speeds of over 150 mph). All-in-all, we will give your guests an experience to remember. We always give a highly personalised service, as we are small enough to care, while still being big enough to cope. Due to the fact that we have such a large and varied collection of raptors at our disposal, we can always ensure that we have sufficient suitable individuals for all of our commitments. While we certainly do not wish to encourage everyone to take up the sport, we understand the fascination that raptors (birds of prey and owls) hold for many people. In today’s “green” society, many people realise that raptors are a barometer for conservation, and would dearly love to be able to get up close to eagles, falcons, hawks, buzzards, owls and other raptors. We also understand the fascination with the historical aspects of this ancient sport, and are extremely keen to ensure that these traditions are maintained, and passed on the next generation. During our demonstrations, we use traditional methods and language, explaining their meaning and origins to our audience. These include the falconry origins of many everyday phrases, such as “fed up”, “boozer”, “cadge”, “apprentice” and many more. In our displays, we simulate the sport of falconry, using live raptors in conjunction with inanimate dummies (lures), while still conveying the spirit, excitement and glory of this ancient sport, and understanding and empathising with people’s sensibilities. 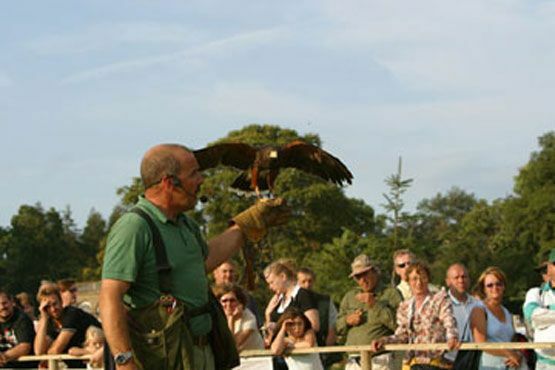 This enables guests to see the spectacle and get as close as humanly possible to a wide range of tame raptors, and also have the opportunity to have their questions answered by knowledgeable and professional enthusiasts.